As 2014 wraps up, we’d like to highlight some of the key announcements over the past 12 months. From the recent acquisition of Prins Autogassystemen to the unveiling of Westport’s first generation of an enhanced spark-ignited (ESI) natural gas system, the company continues to innovate new ways to enable a transition to natural gas-powered transportation. Westport acquires Netherlands-based Prins Autogassystemen Holding B.V. Founded in 1986, Prins is a leading developer of high quality alternative fuel systems powered by liquefied petroleum gas (LPG or propane), compressed natural gas (CNG), and liquefied natural gas (LNG) for light-, medium-, and heavy-duty applications. Prins operations in Europe will be combined under the Westport Applied Technologies business unit. The Weichai Westport HPDI 12-litre engine receives China V emissions certification from the National Passenger Car Quality Supervision & Inspection Center two generations ahead of the current emission regulations. Westport offers fleets interested in the Westport WiNG™ Power System Ford Transit Van a free demonstration program for up to two weeks, designed to give the experience and benefits of operating on compressed natural gas (CNG). The Transit Van is offered with a gaseous prep 3.7L V6 engine at 10,000 GVW and below. During the quarter, Westport delivered 40 shuttle buses powered by the Westport WiNG™ Power System to the Dallas Fort Worth International Airport. The airport operates a total fleet of about 1,000 vehicles and approximately 450 of those are alternative fuel vehicles, half of which are powered by the Westport WiNG™ Power System, including pickup trucks and shuttle buses. Westport’s latest addition to its alternative fuel industrial engines, a 3.8L engine that operates on either liquefied petroleum gas (LPG) or natural gas (NG), is displayed at the High Horsepower Summit in New Orleans. Cummins Westport Inc. (CWI) announces that Rob Neitzke, currently General Manager of the Construction Segment of Cummins off-highway engine business, has been appointed as President of CWI effective January 1, 2015. Westport unveils its first generation of an enhanced spark-ignited (ESI) natural gas system. The new revolutionary approach to natural gas combustion technology is designed to provide vehicle and engine original equipment manufacturers (OEMs) with a "downsized" natural gas solution that is cost competitive while providing similar levels of power, torque, and fuel economy to a larger diesel engine. Westport announces an update to its Westport high pressure direct injection (Westport™ HPDI) second generation or "HPDI 2.0" development program. Expected to provide dramatically better system costs and better compatibility with advanced diesel engine platforms, a key component of the HPDI 2.0 system is a brand new family of high pressure fuel injectors, co-developed with Delphi Automotive PLC (Delphi), designed to provide better cost, smaller size and improved packaging compared to prior generation Westport™ HPDI injector designs. Jill Bodkin is elected Chairman of the Board of Directors. Former Chairman, John Beaulieu, remains on the board as a director and awarded the title: Chairman Emeritus. "My Board leadership will draw on my life's work - building partnerships in international capital markets," "Our Board is committed to building enduring value for Westport," said Ms. Bodkin. "The Board is proud of Westport's people, who today deliver the best of alternative fuel engines and vehicle systems and maintain a lead at the forefront of a global shift to natural gas in all forms of transportation." Westport launches the Weichai Westport WP12 engine and initiates development of WD10 engine with Westport™ HPDI 2.0 technology. Kroger announces the purchase of 40 LNG trucks featuring the Westport iCE PACK LNG Tank System and the Cummins Westport ISX12 G engine. India’s Maruti Suzuki introduces the Celerio Green, a five passenger, bi-fuel car that runs on CNG and gasoline, featuring Westport's natural gas components. Two LNG tenders are delivered to Canadian National Railway. Ashoka Achuthan is appointed Chief Financial Officer (CFO) of Westport. Bill Larkin is appointed to Vice President, Corporate Development, focusing on strategic initiatives and investments, and development agreements. Yang Guang is appointed to the position of President, Asia Pacific to oversee Westport’s Asia Pacific business operations, sales, marketing, engineering, production, and service activities which include China (including Hong Kong and Taiwan), India, Korea, Japan, Australia and Association of Southeast Asian Nations (ASEAN). Westport debuts the only California Air Resources Board and EPA certified Ford F-150, featuring the Westport WiNG™ Power System, at the Alternative Clean Transportation Expo (ACT) in Long Beach. Ford F-250 and F-350 super duty trucks with the Westport WiNG™ bi-fuel CNG system receive Environmental Protection Agency (EPA) certification for its 2015 model year. Westport and Tata Motors Limited launched a new spark-ignited (SI) natural gas 3.8L turbocharged engine featuring the Westport WP580 Engine Management System (EMS). Westport also unveiled its newest proprietary technology, Westport gas enhanced methane diesel (Westport GEMDi™) targeted for medium-duty trucks and buses in India. Final customer validation units of the next generation Westport high pressure direct injection (Westport™ HPDI 2.0) on the Weichai Westport WP12 engine platform are launched. The Weichai Westport WP12HPDI is China’s first engine featuring Westport HPDI technology, delivering the power and performance of the base diesel engine, while replacing up to 95% of diesel fuel with cleaner burning, less expensive natural gas. Westport announces a joint development agreement with Delphi Automotive PLC to help entrench Westport high pressure direct injection (Westport™ HPDI) as the leading natural gas technology platform for heavy-duty engine applications. 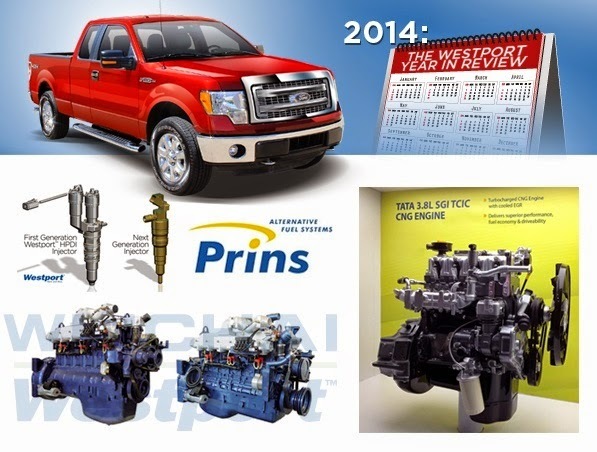 Westport unifies its bi-fuel and dedicated natural gas fuel system products and body configurations for Ford vehicles under the Westport WiNG™ Power System product brand name. Westport unveils its newest proprietary technology -- Westport gas enhanced methane diesel (Westport GEMDi™). Westport GEMDi technology enables engine original equipment manufacturers (OEMs) to offer a fully integrated, high performance engine optimized for dual fuel operation. Tata Motors Limited, India's largest automobile company, launches a new spark-ignited (SI) natural gas 3.8L turbocharged engine featuring the Westport WP580 Engine Management System (EMS).